How to use plastering stop beads. Information about using stop beads, end beads or top coat beads to divide areas that you are going to plaster so that it is more manageable. Learn how to fix the stop beads (and angle beads) and then skim between them. Stop or End beads help to break up the area that you are going to skim plaster which is vital, especially if you are leaning the art of plastering. Stop beads, or top coat plaster beads are a way of dividing large areas of skim plastering into smaller, more manageable segments. Skim plaster goes off very quickly and for the amateur plasterer, laying on and trowelling up more than about 4 square metres in one go is difficult. Top coat plaster is not very forgiving either and even when its painted the little bumps, hollows, ridges and scrapes can be seen very easily. Fixing top coat stop beads is easy. 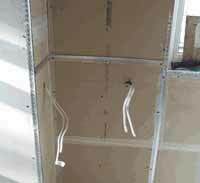 They can be nailed on using short galvanised nails into the studs behind the plasterboard or stuck on with a small amount of skim. This is done by marking a line where you want to fix the beads, then placing a small "dollop" of skim on that line every 900mm or so. Then push the bead into the line of dollops and hold for 3 or 4 minutes while the plaster begins to set. Then cut off any plaster which is beyond the depth level of the bead. In the image below you can see stop beads being used as well as angle beads which are used to form perfect corners. 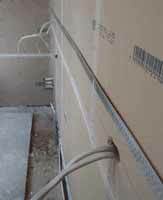 You can also see cables sticking out of the wall before the plasterboard electrical, or patress, boxes were fixed. On the right you can see what it looks like when its all done. Beads are used by the professionals as well. They take so little time to fix and make such a difference to the finish, there is little point not using them. Stop beads can also be used vertically at the end of walls. If, for example, you wanted to turn a chimney alcove into a cupboard you may have a timber frame on one side of the alcove which you could plaster up to. As you probably know, plaster does not stick too well to timber so placing a stop bead on the wall, up against the frame will allow you to plaster right up to the frame without the plaster cracking every time you open the cupboard doors and move the frame. You may want to make a feature out of an old cottage door frame and rather than cover up the joint between frame and wall with the normal architrave, a stop bead can be used to allow you to see all of the old frame. Ideas that make all the difference to the presentation of a job but using the simplest means possible.